Isn't he cute? I made him for my cousin's baby. Shanna is having her first baby, a little boy, and my mom and sister made him a rag blanket with a flannel print with sea creatures on it. 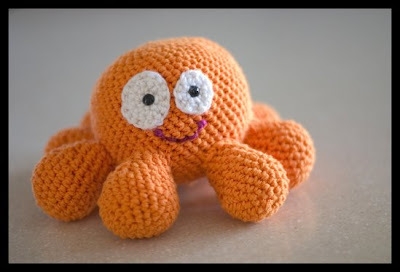 I jumped in and thought I'd crochet him an octopus to go with it. I think it turned out so cute. My boys love it. I found a pattern on the Red Lion site, but decided not to follow it exactly, so I could make him the size I felt like making him. And yes, he does have 8 tentacles. He is SO CUTE! And the first thing I did was count his legs when I saw him. You are so awesomely talented! Did I mention that he's cute?! OMG you should make herds and herds of them- they are SOOOOO cute! Very cute! I like his mismatched eyes. crazy cute. love the proportions. the odd size eyes especially.